Well, I made it home from an adventure of a lifetime very late last night or should I say very early this morning. The trip was fantastic and jammed full of fun and adventure. I have fallen in love with yet another African country. I was spoiled like a princess at the Dingwa household and was even invited back with or Without Lawrence. I can’t begin to describe how fabulous it was but I will try in subsequent posts. But for now I leave you with a teaser of some of my pictures of my once again living out a dream….. Yes, I hugged a lion and rubbed it’s belly!!!!!!!!!!!! I did what Buche, Lawrence and Mr. Dingwa said I couldn’t possible accomplish. Proving once again that I am either the most determined person on earth or crazy. Some would say a mix of both. Either way, I lived out yet another one of my dreams. However, my mother will be relived to know that I didn’t bring one home with me! 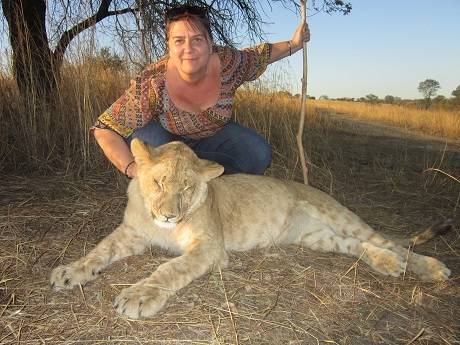 (that was actually her first comment when she learned that I was moving here to Africa that I better not bring home a lion) I am actually supremely delighted to have just prowled the bush with them and get in a hug or two. Meet my new friends who are almost a year old lions who I had the privilege of accompanying on a bush walk while they learned to hunt and try to play with me but that is a whole other story that you will soon hear about. 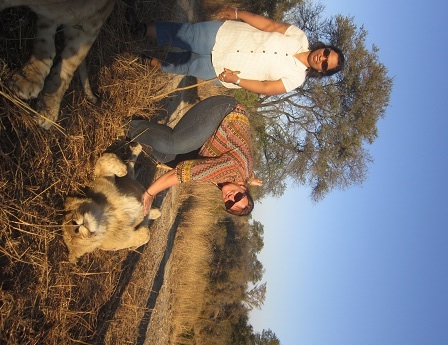 Stay tuned for lots more about my lion adventure and Zimbabwe trip. That is so cool! Did the kitty purrr? Determined and crazy! Love the photos. Amazingly fun!